2.Includes straps and all mounting hardware to secure heavy furniture and your flat screen TV to furniture or the wall. 3.Designed to meet highest quality safety standards to anchor your furniture and TVs to protect your child from tip-overs. Our Anti-Tip Child Safety TV & Furniture Straps give you the security needed to keep your children safe from one of the number one hazards in your home. 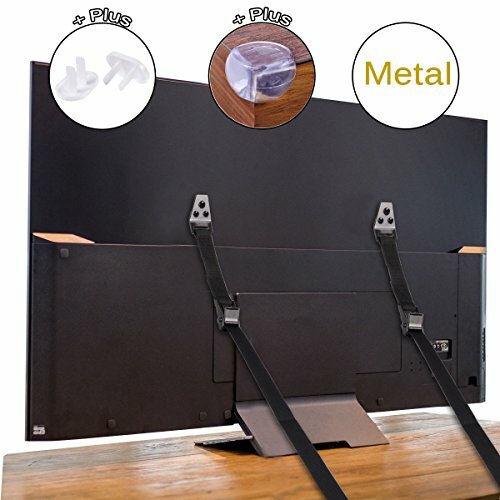 They are uniquely designed and comes with everything you need to secure your Flat Screen TV or Furniture.The perfectly angled give the high quality straps the ideal angle to hold your TV snug to the wall or to the piece of furniture it's on. You will find all the hardware needed to secure your TV or piece of furniture. The longest length of these TV Strap is 26 inches/67cm, before buying please check whether they are suitable for your TV or not. EASY INSTALLATION WITH INSTRUCTION: We know that installing this can sound struggle, but it will turn into simplicity with the step-by-step instruction included in the delivery package. Our previous customers responded that they can easily install in less than 5 minutes with a screwdriver and dresser wall anchors. If you have any questions about this product by Cunina, contact us by completing and submitting the form below. If you are looking for a specif part number, please include it with your message.